Lady Stretton was unaware that she lived in a large mock-tudor villa just south of the A3. She sat for most of the day in a small room at the back of the house, away from the noise of passing traffic and from her relations. She had two sons, two daughters-in-law and three grandchildren and they had chosen the room at the back so that they could forget her. They preferred to think the house was theirs. This was excusable in the case of the grandchildren whose territorial ambitions extended only to the banisters (for sliding down), the scullery, the attic and the back stairs (for avoiding adults). They also colonized a tangle of bamboo, pampas-grass and brambles at the bottom of the garden where they hunted squirrels and dug elephant traps. Lady Stretton’s elder son Jonathan looked in on his mother after breakfast. He carried a copy of The Times which he waved generally in her direction and said, ‘I’ll just read the business section Mater, if you don’t mind.’ Mrs Brown, the daily woman, clearing away her Ladyship’s breakfast of cold tea, cold toast and Golden Shred, ignored him. ‘Gin’, his wife said, and turned back to the Daily Express. Lady Stretton’s younger son Robert breezed in before lunch. The old lady was sitting in her chair and The Times, which had been returned to her in pieces and in the wrong order, had gradually fallen, sheet by sheet, from her lap to the floor. She appeared to be asleep.Robert opened the hand-bag at her side and took out a purse. This he emptied into his wallet. ‘Just running up to town, mama,’ he said for the benefit of Mrs Brown whom he knew to be still around. He went out, leaving the newspaper and his mother as he had found them. The three grandchildren watched the old woman though the window, and made faces at her, pressing their noses and lips against the glass. ‘Her lipstick’s on crooked and she’s got her breakfast all down her front’ they told their parents. It was true that since her husband had died Lady Stretton had declined. She was physically fit but mentally blurred and her relatives reacted to this with disgust and fear and cruelty. They noted her untidy hair, blotched skin and swollen joints, but not her blue eyes, her long fingers and narrow feet. They were embarrassed by her fading, disposable flesh, and did not appreciate the skeleton beneath, which was finely proportioned and, when in repose, balanced like a dancer’s. They heard her non-sequiturs and mirthless laugh but they missed the accuracy of the comments made under her breath and the praise she gave where it was due. When Lady Stretton emerged from her room at the back of the house, she walked with a stick or propelled herself behind a chromium trolley that had been used to wheel in the cocktails when her husband was alive. Her sons hardly remembered their father, though they missed the house in Suffolk that had been sold when he died. They knew, but did not feel, that the old lady shuffling down the corridor was their mother. Lady Stretton made free of the ground floor while her sons were out, happily upsetting objects in her way. Mrs Brown tidied up later, righting chairs, replacing knick-knacks and throwing anything that had broken into the waste-paper basket. When Lady Stretton was downstairs, her daughters-in-law retreated upstairs. She upset them. They found her, without putting it into words, alien but forceful, moving like a tank through the house at just the times of day when, with their husbands at work, they thought to have it to themselves. From the upper floors, they could hear her calling them all by name: ‘Jonathan! Margaret! Robert! Louise!’ then, forgetting the details of their individual selves, ‘Children!’ And sometimes there would be another name, started then bitten back, as if she knew there would be no answer. They had tea together for her sons considered it improper not to share any meal with their parent. Afterwards, Lady Stretton usually fell asleep in her chair, but would sometimes wake and suddenly say ‘you are letting the place to fall into rack and ruin,’ then she would let her spectacles drop to the end of her nose, and glare at them. ‘The lake needs draining’ she would say, and bang her stick on the floor. ‘Do something about it, Robert’. When Robert and Louise or Jonathan and Margaret gave a party, Lady Stretton would be confined to her room. The children, peering through the window, watched her intently, believing her to be a witch. She would play Solitaire, as many as twenty times, always cheating. She sat at her desk from whose various drawers and pigeonholes she extracted papers which she read, or photographs which she turned over face up, as if they were another pack of cards. One in particular she used to look at for a long time, before replacing it beneath all the rest. At seven, Lady Stretton was undressed and tucked up in bed by Mrs Brown who then went home. The children went upstairs for their bath, then returned via the back stairs to take up their station outside their grandmother’s room again. They watched in turns through the keyhole as Lady Stretton hauled herself out of bed and hobbled in and out of view, carrying what looked like ball dresses in her arms. The children deduced that she was ‘dressing-up’ a practice they understood and approved of. But it was Lady Stretton who left. Lady Stretton ‘left’ frequently. Usually she was returned by the police, having been found stumbling up a neighbour’s drive or even flagging cars down on the main road. The police, who were patient and kind, would explain that she said she was on her way back to her old home in Suffolk. She had a penchant for libraries, from whence her family would be phoned by an irate librarian who had found her on the floor of the Reference Department, surrounded by long out-of-date Kelly’s Directories. At other times she was seen in the local supermarket. There, she pushed a trolley, as she did at home, but unsuitably dressed in shorts and brassier. Robert or Jonathan would collect her, manhandling her into a mackintosh and then into the back seat of the car where she cringed like a child molester. This time, Louise had returned from the races with no money, and she ran into the house shouting ‘Lady S, Lady S! Can you let me have some money for the cab?’ There was no answer. Louise penetrated the old servants’ quarters and her mother-in-law’s room. Mrs Brown was patting the furniture with a duster. Mrs Brown fetched her bag and gave Louise a new five pound note. It was part of Lady Stretton’s pension, which she was authorized to collect from the Post Office. Taking the odd fiver was the only way to raise her wages. ‘Your mother’s vanished again,’ Louise told Jonathan. The children were called in to supper and the family sat round the big table in the kitchen. Mrs Brown’s last duty was to feed them, and this she did on tinned vegetable soup, lamb chops and pink blancmange. Despite this menu, with Lady Stretton absent, the atmosphere was cheerful. Margaret loaded the plates in the dishwasher and sighed happily. ‘It’s so much nicer, somehow, when she’s not here,’ she said. ‘No crashes in the middle of dinner as bits of furniture keel over,’ said Jonathan. The thoughts of the daughters-in-law turned to their inheritance. ‘I’d like to say goodbye to this neo-Tudor monstrosity and never come back,’ Louise said. ‘I want to buy back the old house; give Jonathan his birthright,’ said Margaret. Louise sighed, ‘I’d do anything to be in Spain or the South of France. Or Mustique’ she added, dredging the name out of her memory of magazines she read at the hairdressers. ‘Anywhere, as long as there’s plenty of sunshine and cheap booze,’ Margaret said under her breath. ‘What would you do as an ex-Pat, Robert?’ Jonathan asked. ‘I can put up shopping malls as easily there as here, ‘Robert replied. The consensus round the table was that it was a merciful release for a senile old woman. The unspoken view was that it was a merciful release for them all; how much better would they use her money than she ever had. The house would be up-dated (by Robert’s company). 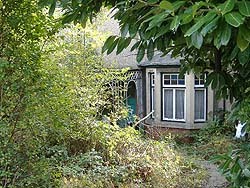 The end of the garden, where the bamboo, pampas grass and nettles festered, would be sold for development. Jonathan looked into the legal position. The family solicitors could not help; Lady Stretton, as far as they knew, was still alive. The days passed; the family grew more convinced that she was dead and that long years of caring for her would soon be rewarded. Each made their plans and, for the first time in many years, there were no quarrels between brother and brother, husband and wife, or even between the children; they understood that there would be money enough to cure all ills. Then, when anticipation was growing unbearable, Lady Stretton came back. There was a splatter of gravel from the drive. The family ran to the windows. A taxi drew up and the driver opened the passenger door. Lady Stretton emerged, stick first. The driver waited to see her safely to the door. Lady Stretton waved, the driver accelerated away, and waved back as he turned the corner. The whole family swore that no money had changed hands. Lady Stretton went straight to her room, smiling. Her sons asked her where she had been. She smiled at them in turn, but said nothing. During the following weeks, Lady Stretton continued to smile as she wandered about the house and the garden until she fell into an elephant trap the children had dug among the bamboos and pampas grass. She was not found for several hours, by which time she was dead. Her sons went through their mother’s desk, but it was empty. In the grate behind the tapestry screen were bundles of letters, inexpertly burned, and a photograph. Jonathan and Robert were not sufficiently interested to pick them up and look at them; they put the screen back and forgot all about the small pyre hidden there. Few people came to the funeral, held in an ecumenical chapel in a municipal crematorium. The family, of course, attended, all smiling. There was one stranger; a young man who stood at the back, silent and sad, and who left without shaking hands. The children had noticed him, and had remarked the likeness. he was tall and thin, with a dark complexion and blue eyes, and a perfect fit for their fantasies about gypsies and pirates in the bamboo grove at the bottom of the garden. When the Will was read, it was learned that Lady Stretton had left all her money and property to a man of whom her family had never heard. The Will was challenged, of course, and there were plenty to testify to her unsound mind. However, the Will had been drawn up many years before, and the solicitor who had still been a young man when he acted for her testified to her sanity, if not her happiness, at that time.